This post provides the important information you need to know in order to transition to customising the Command Bar in Dynamics CRM 2013. 1. The Command Bar is a Ribbon in disguise! The Ribbon Bar in Dynamics CRM 2013 to a certain degree has been replaced by the Command Bar but it still exists on non 'refreshed' entity Forms such as Connection Form and Price List Form, and is still present on all home list view grids in Microsoft Outlook. The Command Bar is actually the same Ribbon structure but rendered differently in the User Interface. Although the Command Bar has no visual concept of Tabs, Groups or Layouts and there is no dynamic resizing and scaling, it still requires the Ribbon Diff Xml with these constructs to function. Using the Ribbon Workbench for CRM2013 will allow you to still edit these structures, but view in both the Command Bar and Ribbon display format. The Command Bar will only show 5 controls at any one time before they are added to the 'overflow' section. This deliberate constraint means that you will need to think carefully about what the user really needs on their command bar. Initially this may sound like a tricky problem but the Command Bar will not display a disabled button – it will always hide it – which means that the 5 buttons being shown will dynamically change depending on what buttons are available to the user. This is a significant improvement over the Ribbon that would always look cluttered even if there were very few buttons enabled for use. To work with the 5 control constraint you can use fly out and split buttons to group commands together and not be moved to the overflow. The Overflow menu can also have fly out controls that open to the right rather than pulled down. 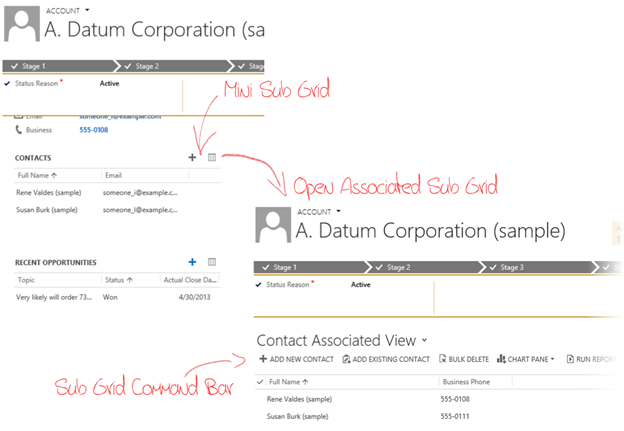 CRM2011 form Sub Grids used to dynamically swap in the Sub Grid Ribbon at the top of a form when a sub grid was selected. This allowed access to the sub grid entity commands directly from the parent entity form but often left a user confused. This functionality has been removed in CRM 2013 and the primary entity Command Bar now always is shown at the top of the form. A new 'mini' Command Bar is shown above each form Sub Grid showing only the 'Add' and 'Open Associated Sub Grid' buttons with the Delete button shown next to each record. If you want to access all of the sub grid buttons you must use the 'Open Associated Sub Grid' button that opens the entire page into the Sub Grid list view. To return to the form you must click on the name of the record in the Nav Bar. You cannot customise this mini Sub Grid at this time other than overriding the 'Add' and 'Delete' command - you cannot add buttons or change the icons of buttons on the mini Sub Grid, but full customisation is supported on the full Sub Grid Command Bar. The visibility of a control on the command bar is defined using a new Display Rule named 'CommandClientTypeRule'. Controls will only show on the Command Bar if their associated Command has no CommandClientTypeRule Display Rules or it has a CommandClientTypeRule is added with Type=Refresh. The control is visible on ribbons of non-refresh entities or in list views presented in Microsoft Outlook. There is a built in Display Rule that is used to hide system buttons from the Command Bar named 'Mscrm.HideOnCommandBar' that has a 'CommandClientTypeRule' with Type=Legacy. Commands with this Display Rule will not be visible on the Command Bar. You can remove this display rule from command to bring back buttons that were hidden by default. I have created instruction on how to do this. 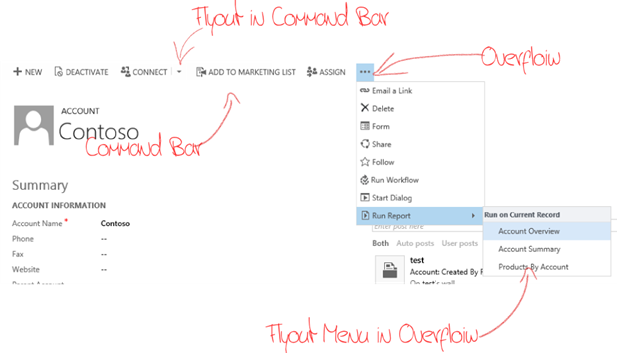 These 4 points will make planning & designing your CRM2013 solution easier and I'm sure you'll soon be loving the clean and responsive user experience that the new Command Bar gives.